Cerberus FTP is a unique server system that uses pem files similar to Apache. As far as Apache “Type” systems go, this one is impressively easy to work with. 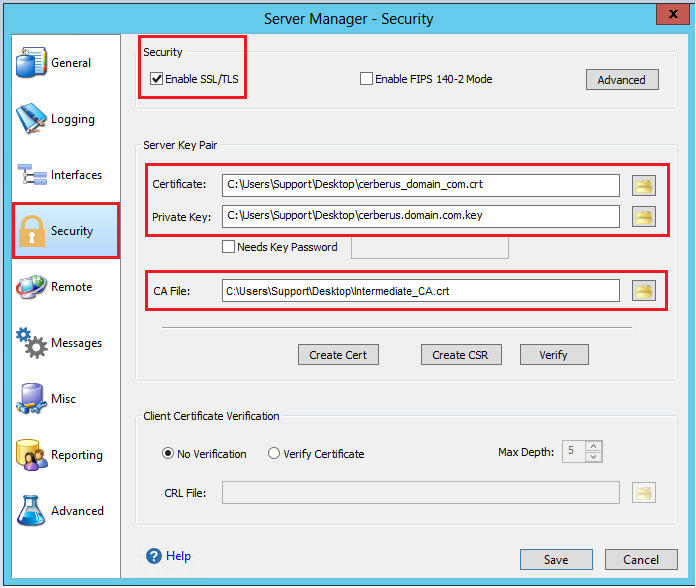 To install your SSL Certificate on a Cerberus FTP system perform the following. If you had the option of server type during enrollment or a lot of times selected something Other than Microsoft you will receive a x509/.cer/.crt/.pem version of your certificate within the email. Alternately you can access your Certificate User Portal by the supplied link in the email to pick up the x509 version of your certificate. Copy the SSL certificate and make sure to copy the —–BEGIN CERTIFICATE—– and —–END CERTIFICATE—– header and footer Ensure there are no white spaces, extra line breaks or additional characters. If your intermediate CA certificate for your product is not in the body of the email you can access your Intermediate CA also in a link within that email. Copy and paste the contents of your Intermediate CA into its own Notepad file and save it with a .crt extension also. Note: Some CAs may require two intermediates for best compatibility. If you receive two intermediates you will copy both Intermediate into one file stacked on top of each other. Typically though the CA may have already performed this form you if two are necessary. 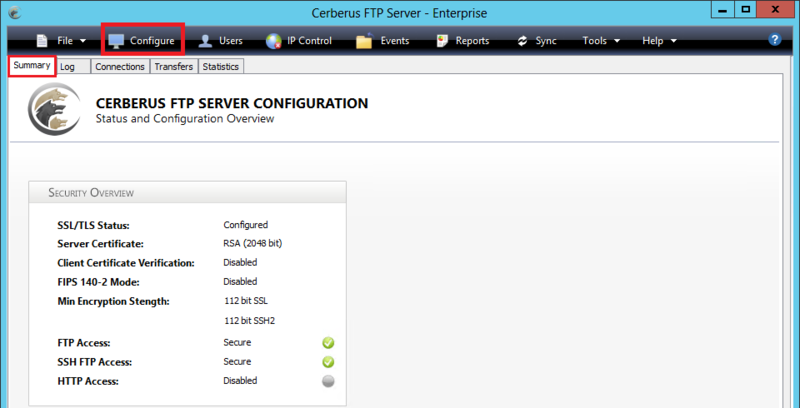 Log into your Cerberus FTP Server console. In the Cerberus FTP Server console, click on the Summary tab. In the top – menu click Configure. In the Server Manager window, in the sidebar menu, click Security. On the Security page, under Security check Enable SSL/TLS. Certificate: Specify and open to the location/path of the SSL Certificate file that you created. Private Key: Specify and open to the location/path of the Private Key file that you created back during CSR generation. The Private key is more than likely in the same location where you originally saved the CSR initially. Note: If you cannot find your Private key file. Then you will have to regenerate a new CSR and perform a reissue of your certificate with your Certificate Authority. This time keeping track of your private key. CA File: Specify and open to the location/path of the Intermediate CA Certificate file that you created. Click Verify to check that you correctly configured the SSL Certificate. If everything is OK click Save. Congrats you have just installed your SSL Certificate request for your Cerberus FTP Server system. If you are unable to use these instructions for your server, Acmetek recommends that you contact either the vendor of your software or the organization that supports it. If this article is helpful, please share it. SSLSupportDesk is part of Acmetek who is a trusted advisor of security solutions and services. They provide comprehensive security solutions that include Encryption & Authentication (SSL), Endpoint Protection, Multi-factor Authentication, PKI/Digital Signing Certificates, DDOS, WAF and Malware Removal. If you are looking for security look no further. Acmetek has it all covered! Contact an SSL Specialist to get a consultation on the Website Security Solutions that can fit your needs. Become a Partner and create additional revenue stream while the heavy lifting for you. FileZilla – SSL Installation Using Digicert Certificate Utility.